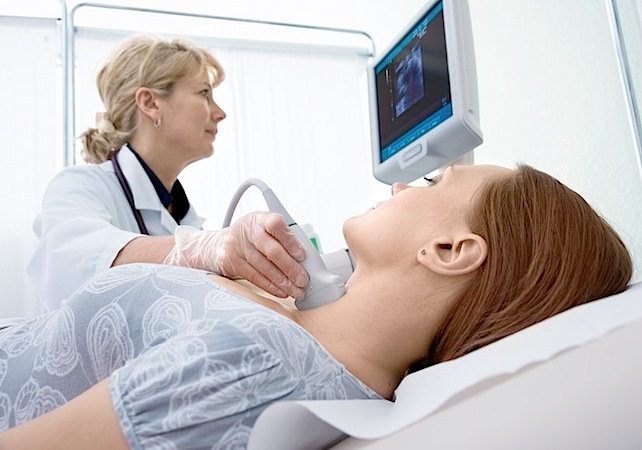 Did you know the vast majority of thyroid cancer diagnoses are FALSE? And yet, the vast majority go ahead and get 'treated' anyway, with total removal of the gland, radiation and life long hormone replacement. Any diagnosis of cancer can be highly traumatic. Given the conventionally held view that screen detected, early-stage lesions or tumors will inevitably grow into invasive, lethal cancers without conventional treatment, receiving a diagnosis represents a psychic wound with adverse physiological consequences that can, in and of itself, injure the patient and reduce their chances of success in treatment. This is all the more clear in the case of overdiagnosis, where a patient's condition is misinterpreted to be potentially fatal, when in fact, the natural history of the lesion or tumor in question is that when left untreated it will never do harm, often producing no symptoms in the life of the patient; or, where it does produce symptoms, the patient does not experience significant disability or death before other causes intervene to take their life. There is also the overarching reality that the health risks associated with aggressive conventional treatment of early-stage 'cancers' often results in the 'solution' being far more harmful than the condition being treated. The very real trauma (literally "wound") of cancer diagnosis can no longer be considered a strictly theoretical concern. A recent study published in the New England Journal of Medicine found that, based on data from more than 6 million Swedes 30 and older between 1991-2006, a positive diagnosis of cancer increased the risk of suicide up to 16 fold and the risk of heart-related death up to 26.9 fold during the first week following diagnosis versus those who were cancer free. The association was prognosis correlated: the more severe and treatment resistant the condition (e.g. brain cancer was highest), the higher the increase in both suicide and heart-related death. Obviously the implications are astounding, especially considering that a misdiagnosis or overdiagnosis can have lethal consequences, putting the medical system in a position of responsibility for doing profound harm by applying screening programs to asymptomatic and otherwise healthy individuals, who are not given the opportunity of informed consent about the real risks associated with these so-called 'preventive' programs. It should be noted that there are mechanisms available to explain this disturbing association between the trauma of diagnosis and increased risk for death. We now know that the secretion of adrenaline, associated with stress and the fight-or-flight response, actually activates genetic processes within cancer cells that make them more treatment resistant.1 Stress associated excess cortisol levels will also down-regulate cancer immunosurvillence in certain individuals. In other words, this is not some 'magical' mind-body phenomena, rather, we now know how placebo/nocebo factors related to the latent symbolism and signification of the ritual of clinical interactions and the patient-doctor relationship gear into real physiological processes, whose adverse health consequences have been characterized down to a molecular level. We have spent significant time researching and writing on the problem of overdiagonsis in the case of breast cancer, where it is now known 1.3 million US women were overdiagnosed for breast cancer over the past 30 years , due to misinformation driven breast screening programs. These women, many of whom were diagnosed with ductal carcinoma in situ (DCIS) , a condition know believed to be essentially benign, underwent unnecessary mastectomies, lumpectomies, radiation and chemotherapy treatments, resulting in massive psychic, financial, and health crises that should never have transpired. Many of these women suffer from a Stockholm syndrome-like state (victim identifies with aggressor), participating in promoting unnecessary screenings and treatments to women through breast cancer industry funded cause-marketing campaigns as part of their 'healing process' -- never quite appreciating the nature of their trauma , while contributing to reproducing the same violation in other women while thinking they are helping to 'save' lives. The authors of the study concluded: "The results of this study support the notion that many thyroid cancers are part of a reservoir of nonfatal tumors that are increasingly being overdetected and overdiagnosed." A clear perspective on the problem is available through the National Cancer Institute's U.S. Thyroid Cancer Diagnosis and Mortality statistics from 1975-2011. In the graph below you find new thyroid cancer cases have been rising on average 5.5% each year over 2002-2011, with death rates actually rising on average 0.9% each year over 2001-2010. We would expect to find the opposite trend if these early diagnosed and treated cases were actually cancer. Even more cognitively dissonant is their graph of the seemingly successful 5-year survival rate, boldly declaring 97.8% of diagnosed cases between 2004-2010 survived 5 years, falsely implying that their lives were benefited or even saved by being overdiagnosed and overtreated. If any of these patients died at year 6 from an unnecessary treatment related cause, it is common practice to consider it a separate disease process, further generating the illusion that iatrogenic harm had not been done and of the success of the screenings and treatments being employed. "No new risk factors, but one, can completely explain the surge of [small papillary cancer] lesions: the exponential increase in the use of diagnostic imaging"
The article goes on to describe "a worldwide epidemic of thyroid cancer without a corresponding increase in thyroid cancer deaths," and explains, "The majority of these cancers are small papillary cancers, the most indolent type of thyroid cancer, with a mortality of less than 1% after 20 years of postsurgical follow-up." A study is referenced that "suggested that if all thyroid glands were subject to millimeter- thick cuts, the pathologist would detect minute or microscopic thyroid cancers in everyone." "Observational studies have strongly suggested that treatment does not change the indolent course of small papillary lesions, which do not evolve to cause metastatic disease or death. Owing to the excellent prognosis associated with small papillary thyroid cancers, it may be reasonable to put them in the same category as has been suggested for ductal carcinoma in situ of the breast renaming them as papillary lesions of indolent course (PLICs)"
Despite this indolent nature, the so-called 'standard of care' is total removal of the thyroid (thyroidectomy) for the treatment of these small papillary lesions ('cancers'), followed by often unwarranted radiation treatment (a cancer causing treatment) and lifelong, mostly synthetic, thyroid hormone replacement, which itself may carry increased risk of lung cancer . This notion that many screen-detected cancers, including breast, prostate, lung and thyroid, should be entirely reclassified as benign or of exceedingly low concern, received great support last year with the publication of an National Cancer Institute commissioned expert review on the topic that we reported on in our article: "Millions Wrongly Treated for 'Cancer,' National Cancer Institute Panel Confirms ." The information, however, is not getting to the 'front lines' of this war soon enough. The collateral damage from the 40-year declared War on Cancer is as real in terms of human suffering and wide-reaching as any major historical global military conflict, and literally depends on diagnostics and interventions gleaned from the most deadly and cruel weapons humans have created: radioisotopes (radiation therapy) and chemical weapons (chemotherapy). The editorial on thyroid cancer overdiagnosis suggests that one way this false epidemic can be mitigated on the front end is through reducing overtesting: "Overtesting is the use of a test unlikely to produce net benefit for the patient." The general implications are clear. Information gleaned from modern diagnostic technologies is being misinterpreted, and in some cases misused to benefit a burgeoning biomedical industry that thrives both on the sales of expensive technologies and highly profitable treatments and follow-up care. Clearly a more nuanced view of cancer in general needs to be instituted to protect against the possibility of mass iatrogenic collateral damage associated with overdiagnosis and subsequent overtreatment. The big 'C' – Cancer -- is not a monolithic entity, or some irrepressible juggernaut like force of lethality. While there are cancers that take on aggressive, treatment resistant form, these are the vast minority relative to the submerged iceberg of non-lethal forms, some of which can be treated with a combination of anti-cancer foods, alternative therapies including detoxificaiton, mind-body practices and traditional plant medicine, as well as through enhancing the body's immunosurveillance. In some cases, such as so-called pre-cervical cancer associated with HPV infection, watchful waiting – essentially doing nothing to intervene – results in remission in the vast majority of time . Even so-called invasive breast cancer has been found to be reabsorbed by the body in some cases, according to a Lancet Oncology study. And then there is the fact that conventional cancer diagnosis and treatment methods are almost all invariably carcinogenic – an irony that can not be over appreciated. Should we be surprised at these results? Perhaps not so if we better understand cancer as an adaptive response to radically altered environmental conditions within the body, which include infections, suboptimal nutrition, toxic and toxicant exposures, and a wide range of incompatible or outright damaging nutritional, environmental and lifestyle changes associated with the post-industrial world. Reducing unnecessary exposures to biomedical diagnostic technologies and highly toxic treatments should be the first step in cancer prevention and not treating the body as if it were designed to be a cancer time bomb ready to explode, rather than a miraculous self-healing meta-organism that is destroying abnormal cells on a moment to moment basis when treated in accordance with its highly intelligent design and requirements for clean food, air, water, and balance in mind, body and soul. Note: For relevant research on both the harms associated with conventional thyroid cancer treatment, and potential natural/integrative alternatives, view our Thyroid Cancer research page on the topic. This page contains a single entry by sal published on May 27, 2014 12:54 PM. Solar Roadways was the previous entry in this blog. Activist Moms Confront EPA About Roundup Herbicide is the next entry in this blog.